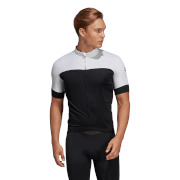 Thermal formfitting jersey with knit fabric provides light wind protection ideal for mild temperatures or under a jacket thermal stretch moisture wicking fabric keeps the body warm and dry. Warm Moa fabrics are distinguished by high breathability and lightweight. They keep the body cool and dry both by extreme hot and milder weather. Elastic yarns grant optimal fitting and pleasant softness. Warm Moa fabrics are realised in 3 versions depending on weight, treatments and membranes. Nice but size tuns a little short. 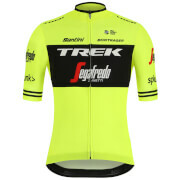 This is a very well made Jersey but the large size is closer to a medium.